TEHRAN, Iran -- The strength of protests shaking Iran was unclear on Thursday after a week of unrest that killed at least 21 people, with fewer reports of demonstrations as government supporters again took to the streets in several cities and towns. It wasn't immediately clear if the drop in reports of new demonstrations challenging Iran's theocratic government meant the protests were subsiding or that the authorities' blocking of social media apps had managed to stop protesters from offering new images of rallies. However, while CBS News sources in Iran said there were sporadic, small uprisings reported around the country, the deployment of thousands of security forces appeared to have largely restored order -- by force and intimidation -- in most places. Estimates put the number of people arrested during the past week of unrest at more than 1,000, but the government has confirmed only about half that amount of detentions. One witness said some protesters were seen being driven away blindfolded on the backs of motorcycles, the preferred mode of transportation for the feared Basiji paramilitary force, linked to the elite Revolutionary Guard. Meanwhile, the Trump administration acknowledged the speed and breadth of the protests took both it and the Iranian government by surprise. The past week's protests have been the largest in Iran since the disputed 2009 presidential election, which ended in bloodshed. While many Iranians denounce the violence that has accompanied some demonstrations, they echo the protesters' frustration over the weak economy and official corruption. Nikki Haley addresses Iran protests, North Korea at U.N.
Thousands rallied on Thursday in support of the government in various towns and cities, including in the northeastern city of Mashhad, where the anti-government protests began last week and extended to other cities. State television repeatedly broadcast nationalistic songs and described the pro-government rallies as an "answer to rioters and supporters to the riot." That appeared to be a reference to President Donald Trump who tweeted in support of anti-government rallies. The TV also broadcast footage of similar pro-government gatherings Thursday in the cities of Shiraz, Isfahan, Ardabil, Birjand and Yasuj. Meanwhile, a top Russian diplomat warned the United States not to meddle in Iran's affairs and suggested that Washington wants to use the unrest to undermine the Iran nuclear agreement. "We warn the U.S. against attempts to interfere in the internal affairs of the Islamic Republic of Iran," Deputy Foreign Minister Sergei Ryabkov told the state news agency Tass on Thursday. Ryabkov also said Washington "is tempted to use the moment to raise new issues with regard to the JCPOA," the Joint Comprehensive Plan of Action that limits Iran's nuclear program, including restricting uranium enrichment for 10 years. Vice President Mike Pence said Wednesday the U.S. wants an agreement lasting longer. In a letter Wednesday to United Nations officials, Iranian Ambassador Gholamali Khoshroo complained that Washington was intervening "in a grotesque way in Iran's internal affairs." He said Trump and Vice President Mike Pence were personally stirring up trouble. "The president and vice-president of the United States, in their numerous absurd tweets, incited Iranians to engage in disruptive acts," the ambassador wrote to the U.N. Security Council president and U.N. Secretary-General Antonio Guterres. Iran's Foreign Minister Javad Zarif pointed to Mr. Trump's own previous comments voicing support for the Iranian people, saying the U.S. leader had an "odd way of showing 'such respect' for Iranians." Trump has an odd way of showing “such respect” for Iranians: from labeling them a "terrorist nation" & banning them from visiting the US, to petty insults on the name of the Persian Gulf. But best of all, "helping them" by depriving them of the economic dividends from the #JCPOA. Mr. Trump's U.N. envoy, Ambassador Nikki Haley, has called for an emergency Security Council meeting on Iran, saying the U.N. needed to speak out in support of the protesters. As yet, no meeting has been scheduled. Late Wednesday, senior Trump administration officials acknowledged their surprise that the protests took hold so quickly. "This was not on our radar," said one official, who like the others spoke on condition of anonymity to discuss intelligence matters. 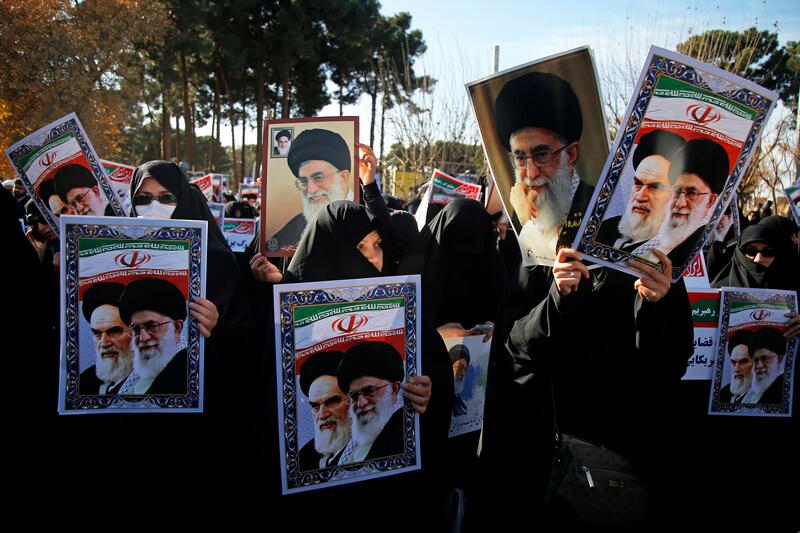 The officials said they believed conservative opponents of Iranian President Hassan Rouhani, a relative moderate within Iran's clerically overseen government, started the demonstrations in Mashhad, but quickly lost control of them. That largely mirrors analysts' beliefs. The officials also said internet suppression by Iranian authorities made it difficult for protesters to publish their videos, with an upload sometimes taking the entire day. They said the U.S. government is still looking at its options at helping open up the internet, though no decision has been taken yet.